Are Identity Theft Protection Services Worth the Money? Identity theft protection services usually have two components – theft prevention services and theft repair services. When it comes to theft prevention services, they aren’t doing anything you could do yourself. The question becomes whether or not the service fees, which can run $20-30 a month at some places, is “worth it.” If it takes you several hours to complete the same tasks, including setting up reminders, it might be worth it to pay someone else to do it. If it takes you an hour and it’s an hour you’d be spending watching television, then it might not be. In order to really do the tradeoff, let’s see what you would have to do to get similar results. The main thing that id theft services do on your behalf is freeze your credit reports. By freezing your report, no company can access your report and, subsequently, make a credit decision. This stops all credit card offers in their tracks because they know nothing about you. You can freeze your credit report yourself and it won’t be free (neither will “thawing” it), but it’ll be cheaper than the id services. This stops new offers from coming along but it won’t stop offers from your existing relationships (if you have a Citi card, Citi might send you more offers since it has your payment history with the first card). To stop those, you need to call the company and ask to be removed from their marketing lists. Finally, it might not come as much of a surprise but companies will offer you credit cards even if they know nothing about you (surprise!). To stop those offers from happening, you can register at OptOutPrescreen.com. Now that you’ve stopped incoming offers, it’s time to “monitor.” You can use a combination of free credit score services like Credit Karma (TransUnion partnership) and Credit Sesame (Experian partnership) to keep tabs on your credit report. They give you credit bureau scores, not FICO scores, but you can use it as a way to monitor any changes to your credit report. A sudden drop or rise might indicate a need to review it in greater detail. Both are free. Here is where it gets tricky because theft repair services only come into play after your identity has been stolen. I’ve never had my identity stolen but I have had to repair erroneous listings on my report (there was an extra social security number, address, and cell phone account) and that took a couple hours to fix. I had to contact the bureau, they had to tell me what documentation I needed to refute the listing, I had to collect that information and fax it to them. All told it was about two hours plus the waiting time for them to review the documents – and it was a minor case (I wouldn’t even call it theft). You can think of the id theft protection service plans as insurance, since in theory they will handle the clean up. Is an insurance policy worth the monthly service price? 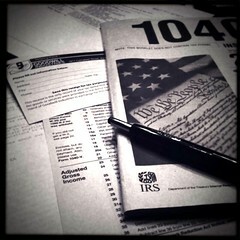 There are many reasons why you should e-file your taxes. By e-filing your taxes, you get your tax refund faster. By e-filing your taxes, you avoid the post office. But in terms of importance, there probably isn’t any reasons better than avoiding identity theft. Think about all the information you need to include on your tax return and how that information, if you mail your return, is being sent unsecured through the mail system. Your tax return contains all the personal information a thief would need to steal your identity – your address and your social security number. It also contains information about your family, such as your spouse and any dependents, as well as their social security numbers. If includes the names of the banks and brokerages you use, those are included as 1099s, as well as roughly how much is in each of those accounts (they can assume an interest rate and calculate your balances based on the reported interest). They will know if you own or rent where you live, as well as several other details based on the deductions you claim. Your tax return contains a frightening amount of information about you and while mailing your return is 99.999% safe, why take the risk when you can e-file and get all the other benefits? E-filing is smart on a number of levels and with the scary statistics involving identity theft, you might as well reduce your risk when it’s as simple as this.